I'll be ChiILin' with Chi, IL's Porchlight Music Theatre for their matinee Thursday, Nov. 15th. Check back soon for my full review. These short runs do tend to sell out so don't wait to get your tickets. These “lost” musicals in staged concerts are a hoot and a favorite of ours here at ChiIL Live Shows. Porchlight Music Theatre begins its sixth season of Chicago’s “lost” musicals in staged concert series with Porchlight Revisits 1776, music and lyrics by Sherman Edwards and book by Peter Stone with direction by Artistic Director Michael Weber, musical direction by Jeremy Ramey and musical staging by Michelle Lauto. Porchlight Revisits 1776 is presented for two-nights-only Wednesday, Nov. 14 at 7:30 p.m. and Thursday, Nov. 15 at 2 and 7:30 p.m. at The Ruth Page Center for the Arts, 1016 N. Dearborn Street. 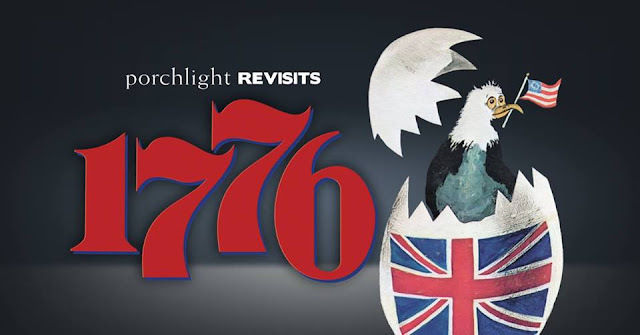 Tickets for 1776 are available now for $37, subscriptions to the three performance series including 1776, Can-Can, March 6 and 7, 2019 and Minnie’s Boys, May 22 and 23, 2019 are $90/per person and available at porchlightmusictheatre.org or by calling the Porchlight Music Theatre box office at 773.777.9884.